What is this? 15 minutes of a guy in the woods playing with sticks and mud? I’m not watching all of this. [15 minutes later …] That was amazing. Subscribed. 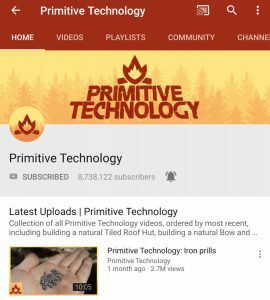 Fast forward and today, I’m one of Primitive Technology’s 8.6 million subscribers. TV shows with full-blown budgets would sell their souls for that size audience. In an attention starved world, why are these videos so engaging? 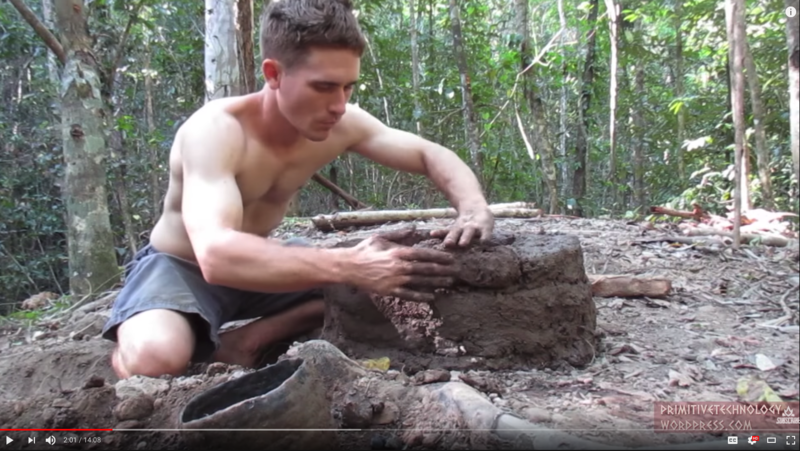 Watching John Plant, the guy behind Primitive Technology, create huts, baskets, forges, and more from scratch is simply mesmerizing. It helps that it’s edited well, so you get the sensation that all of this production is done quickly. Yet there’s something more to it, still. Working silently with bare hands and made-from-nothing tools in a forest in Australia, Plant remakes the world in his own image. You and I get to ride along. In the Shaker approach to the divine, work itself was understood as an act of prayer. Their handcrafted objects were created to be as simple and functionally perfect as possible, and so the process of creating an object is a holy one, requiring single-minded attention on the task at hand. The creator themself disappears in communion with the process. Personal glory is tossed aside as gently as a shirt in the Australian forest. This is the religious impulse one can see in Primitive Technology: a steady, silent, humble, monastic concentration. There is no endpoint to the work, and if—as was the case when PTG bought his new land to build on—the old works are abandoned to begin all over again, there’s nothing to mourn when they disappear. The mandala washes away, and the labor itself—the mindful thinking, the repeated attempts at improvement, the idea becoming a small carefully-built solid—is the focus. This idea of work as a spiritual act resonates deeply for me. I’ve realized over time that there’s peace within the monotony of everyday tasks. Even healing. An idea I picked up nearly a decade ago from William Glasser’s Control Theory is that while we can’t control very well what we think or feel, we can control what we do. And it’s often the case that by simply doing something productive, we can change our situation enough to give us much needed perspective on our negative thoughts or emotions. Can you control what you think? Hard. Can you control your physiology? Even harder. Can you control what you feel? Near impossible. So what you can control? What you do: Do something—anything—productive. Work is also quintessentially human. As Plant builds in the woods in silence, we watch in reverence, awed by the ritual. From nothing, man transforms the world. Knowing this thing—this power in each of us to transform, to create—is deeply affective. The act of changing the world, even in the smallest way, is a reminder of our individual power to improve our lives—or the lives of others. We don’t have to build huts from mud to tap into this spiritual, empowering aspect of our humanity. Improve your world in small ways. And when you need inspiration, go to the church of Primitive Technology. Nice blog post. I enjoyed reading it.